Europe’s largest defense contractor said it is throwing its weight behind a company called Prismatic in the development of the firm’s solar electric-powered PHASA-35 vehicle. The deal could eventually see marketing of the solar electric-powered machine taken up by BAE, the spokeswomen said. Solar-powered UAVs able to operate on the margins of space for months at a time could potentially provide surveillance, beyond line-of-sight communications and other services to military and civil users far cheaper than the cost of satellites. The machines are sometimes referred to as high-altitude pseudo-satellites, or HAPS. Prismatic flew a PHASE-8 aircraft, a quarter-sized scale model of the high-altitude, long-endurance, or HALE, vehicle last year. The spokeswomen said the British Ministry of Defence had attended the flight trial. “A representation from the MoD was present at the first flight of the PHASE-8. We have committed to keeping MoD up to speed with our prototype development with a view to engaging further in the future to develop innovative solutions utilizing HALE/HAPS via PHASA-35,” she said. The PHASE-8 scale model was built by Prismatic at Farnborough, but BAE wouldn’t comment on where future production will take place. PHASA-35 is expected to fly at up to 70,000 feet and carry a payload of about 15 kilograms, according to information on the Prismatic website. The two companies said the machine has the “potential” to fly for 12 months without returning to the ground. 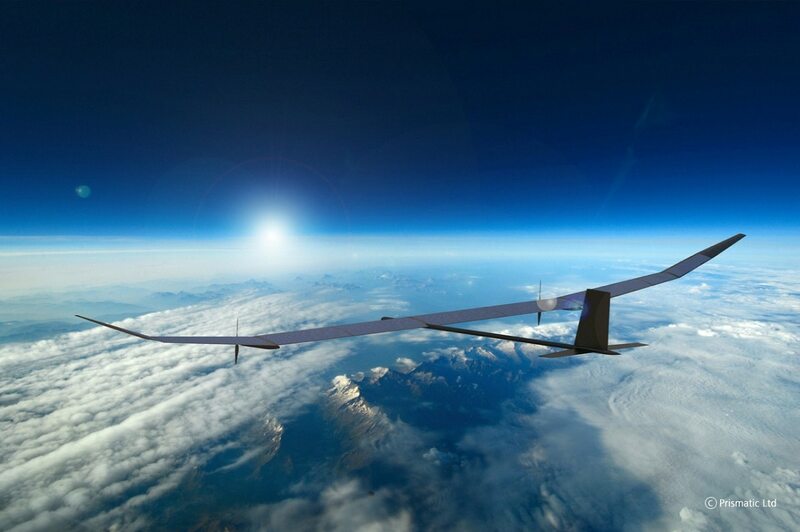 Airbus Defence and Space developed the Zephyr, a solar-powered machine that currently holds the endurance record, having flown for 14 days nonstop. A new version ordered by the British military and known as the Zephyr S is expected to beat that record. The first of three production-standard machines destined for the British is expected to fly in the next few months. The BAE spokeswoman said the company has been in contact with Prismatic for about a year and a half. “Our relationship began through mutual connections in the space sector. We recognized synergies that could be brought from the rapid prototyping approach delivered by the Prismatic team, and over the past 18 months have built a relationship which saw the PHASE-8 aircraft fly in 2017 and has to date culminated in the agreement we have just signed to invest in PHASA-35,” she said. Airbus and AeroVironment are among the leading developers of solar-powered UAVs. At the start of this year AeroVironment, a long-time developer of HALE technology, struck a joint-venture deal to take a share of Japanese company HAPSMobile, which is working on applications for the commercial market.